Newberg, OR. St. Cousair Co., Ltd. (HQ: Nagano Pref., Iizuna Machi/ CEO: Ryozo Kuze) is a specialty store retailer in Japan, operating over 100 specialty stores under the private labels “Kuze Fuku & Co.” and “St. 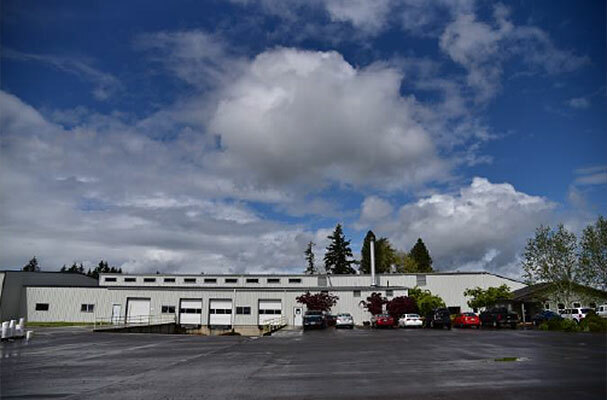 Cousair.” The company officially acquired a fruit processing plant in the State of Oregon, USA, on April 29, 2017 (Japan Time) and is currently preparing to penetrate the U.S. market through U.S. based distributors. The current business strategy is to produce quality private brand products and OEM products for other companies selling high quality products in both the U.S. and Japanese markets. The acquisition allows the company to produce and supply superior products, such as jams, compotes, fruit preserved in syrup, dressings, sauces, and dried fruit, and to make the best out of the rich resources from Oregon and the knowledge accumulated from experiences in the Japanese market. The new U.S.-based corporation, St. Cousair Inc. (hereafter referred to as “SCOO”), is to be headquartered in Newberg, Oregon, and is established through the acquisition of Berry Noir Co-packing Inc. (hereafter referred to as Berry Noir), owner of 30 acres of farmland and approximately 1 acre of processing plant space for fruit compotes, jams, juices, and dressings. 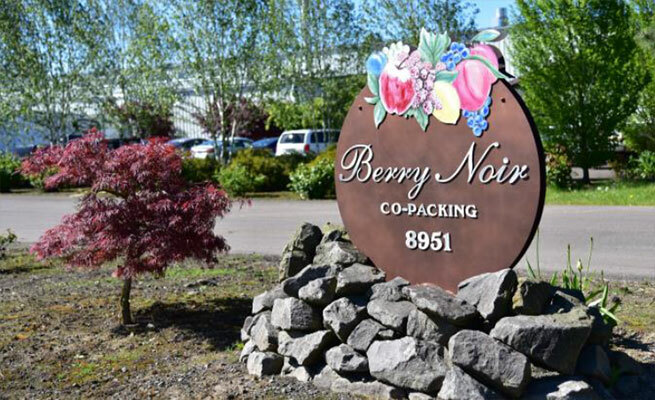 The employees of Berry Noir, well experienced in food manufacturing, understand the value of St. Cousair’s principles, and they have agreed to work for SCOO. Therefore, the processing plant is well-prepared to produce products for SCOO’s business. The amount of the acquisition is not being disclosed to the public. The acquisition is based on a Sales Agreement, which consists of an acquisition of assets owned by the company. The assets include manufacturing and sales licenses necessary for the food business, and fixed assets, such as real estate, buildings, a manufacturing facility, etc. This M&A contract does not include a stock acquisition. Both parties have agreed on this acquisition agreement after approximately six months of negotiation. 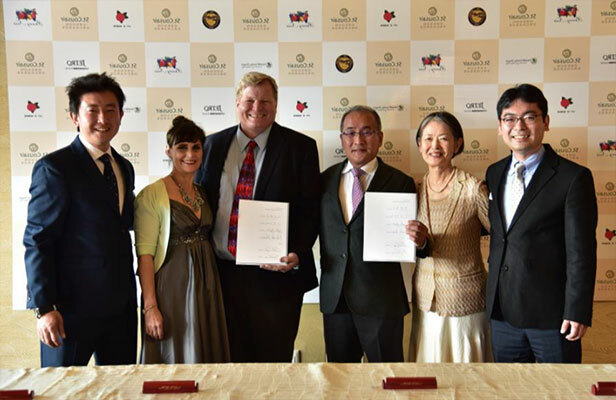 The signing ceremony was held on April 28, 2017 to mark the official acquisition agreement regarding Berry Noir’s assets. 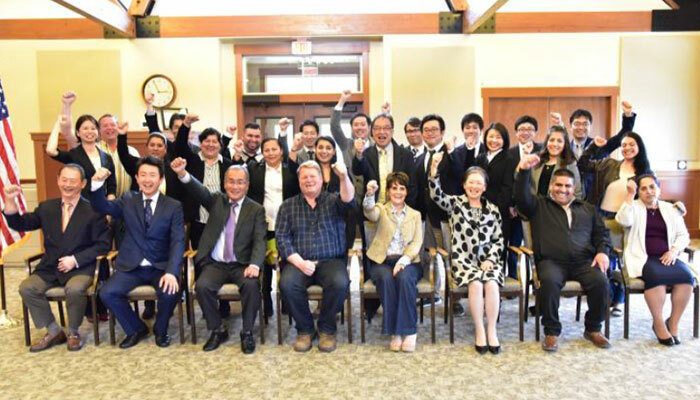 Executive members from both St. Cousair and Berry Noir, along with State and regional government officials and Japanese consular officials from Portland, attended the ceremony. The SCOO initiation party was held on May 1, 2017 among Berry Noir employees and St. Cousair’s executive members, and first manufacturing started on May 2nd. The company’s goal is to generate $10 million yearly after 3 years. I have researched mainly in the West Coast area, including California, Washington, and Oregon, to find the most desired conditions, such as high quality farm-produced products, safe, quality water sources, appropriate tax rates, well-educated human capital, economical utility costs and other factors. After holistic research, we have decided to focus on Oregon. Due to the increase of our retail stores in Japan, demand has grown to the point that our manufacturing capacity is about to reach its limit. In order to respond to this growing demand, the company considered investing in a new manufacturing facility in Japan. This acquisition in the U.S., however, has solved this issue without investing in a new facility in Japan, which would have cost more. 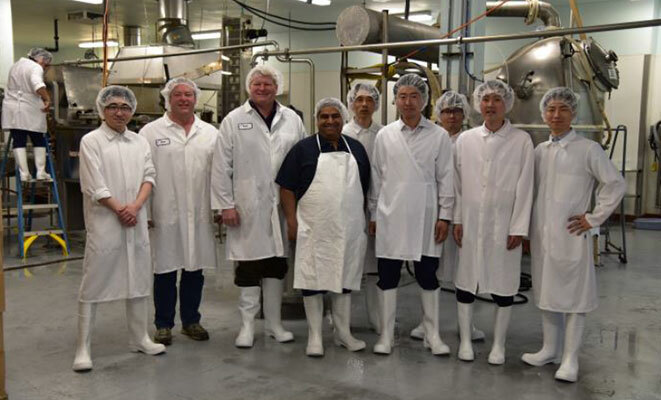 Producing quality food from the best of the rich resources of Oregon will bring tremendous benefits to customers in both the U.S. and Japanese markets. 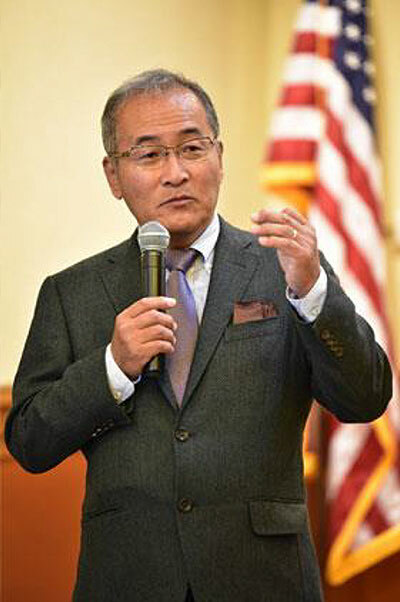 In addition to the fruit business, U.S. food business sectors show great interest in Japanese specialty products from Kuze Fuku & Co., according to local research. We want to work with other suppliers in Japan to develop safe, authentic Japanese food products to meet demand from not only Japanese consumers or Japanese Americans living in the U.S., but also from American consumers who may not be familiar with Japanese food. Our vision is to provide exposure of our company’s brand concept, ‘Country Comfort,’ to every household around the world. We want to take our first step in Oregon, where the environment is very similar to our homeland of Nagano Prefecture. I believe this place will be a bridge between the U.S. and Japan. 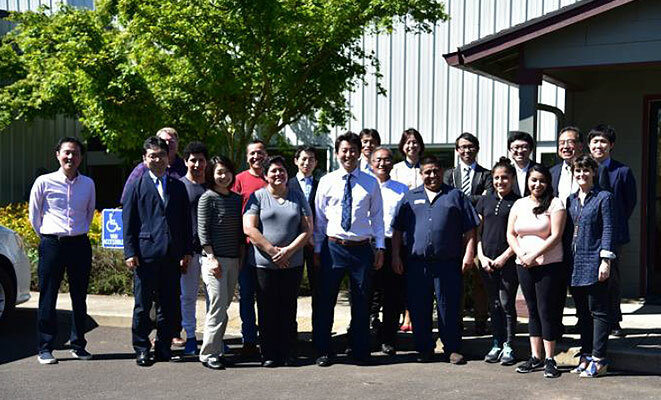 In addition to that, we would like to work together with other Japanese food producers who make products for Kuze Fuku & Co., to expand potential markets for Japanese food. At St. Cousair's stores, quality wine and local beer directly imported from Oregon will become available, and we will introduce those at the Oregon Fair. We will do our best to deliver delicious goods, using fresh and tasty fruits nurtured by local farmers, to consumers living all around the world. The Pacific Northwest is well-known for producing quality fruits. The temperature difference between night and day, and the low amount of precipitation during the summer harvest season, helps quality fruits, such as apples, blueberries, cherries, and nuts, to grow. Berry-related fruits are especially abundant. 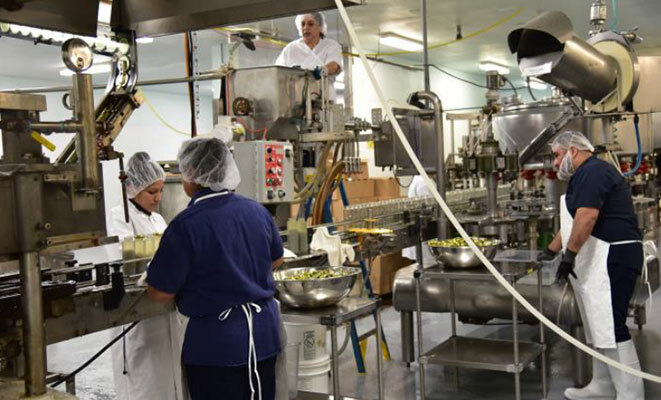 Obtaining a manufacturing facility in this area allows SCOO to procure ingredients directly from local farmers, so the company can produce high quality products and differentiate it’s brand. Although shipping and other export-related costs will incur, shipping Oregon-produced foods to Japan will result in sufficient cost reduction benefits. St. Cousair is aiming to expand sales channels worldwide through its relationship with partners in the U.S.
Also, Oregon is geographically close to Japan, compared to other locations in the US, and the adjacent State of Washington has port facilities in Seattle, making access to Japan much easier for both people and goods. As a first step into the U.S. market, St. Cousair officially acquired land and a manufacturing facility. The facility has manufactured private brand products for big name retail distributors in the U.S., and has existing distribution channels to Japan in place, so it is a great facility for quality control and manufacturing function purposes. Additionally, U.S. produced blueberries, which St. Cousair has procured in the past, can be obtained at about half it’s previous cost, benefitting the production of St. Cousair’s existing jam, and potentially providing delicious products at affordable prices for our customers in the future. 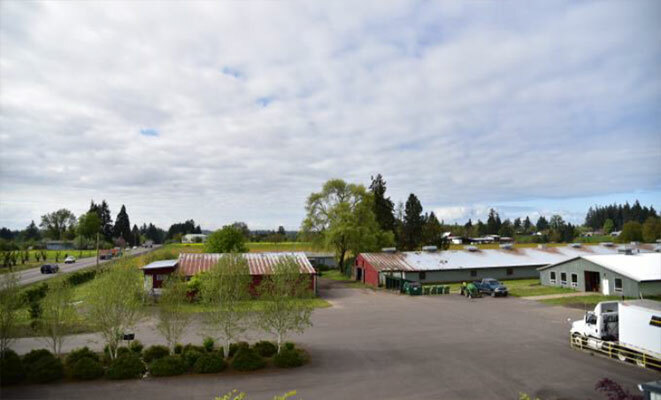 The SCOO facility is in a sprawling natural setting, 30 minute’s drive from Portland, Oregon. The thirty acres of this acquired land is equivalent to “St. Cousair Forest,” a facility in Shinano-machi, Nagano, acquired by St. Cousair in 2013. The SCOO facility and office occupy one acre of the acquired land. Though surrounded by nature, it is still close to the city. Therefore, it is the best location for keeping St. Cousair’s philosophy, while expanding business worldwide. 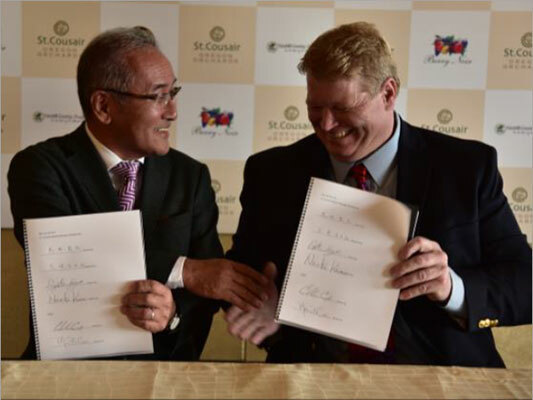 Our vision is to create a place for families to gather to enjoy shopping and dining, as people currently do at St. Cousair Winery in Iizuna, Nagano. A new chapter for St. Cousair began on May 1, 2017. The journey, which began in 2015, has been very long, yet the real challenge has only just begun. Products: Jams, Fruit Sauces, Drinks, Fruit Preserved in syrup, BBQ Sauce, Smoothies, Dressings, Pasta Sauce, etc. 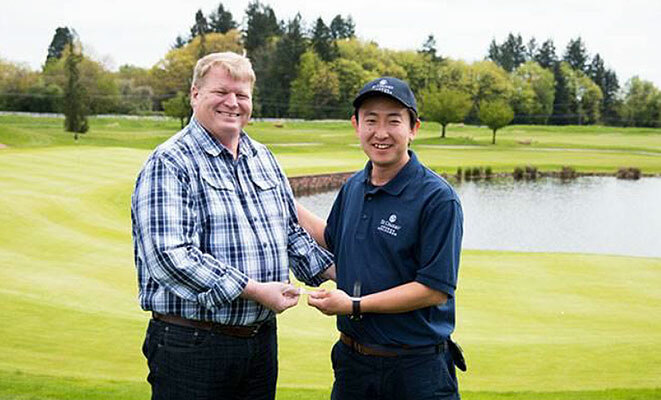 The signing ceremony was held at the Allison Inn & Spa on April, 28 in Newberg, Oregon. aerial view of SCOO, SCOO and St. Cousair employees, SCOO Office and Facility. May, 3rd: St.Cousair’s executives visited The Mayor of Newberg. 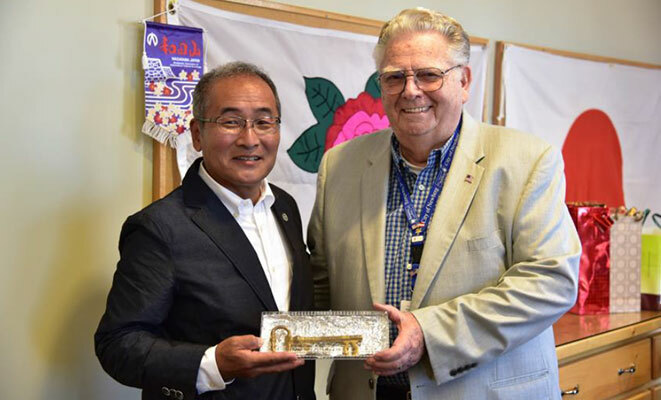 A key to the City of Newberg with the inscription ‘SCOO’ was given to commemorate joining with Newberg in friendship. With employees of Berry Noir on May 3rd. We finished our very first production without any issues. Our new products will be produced here. St.Cousair’s CEO, Ryozo Kuze, speaking at the initiation ceremony on May 1st. 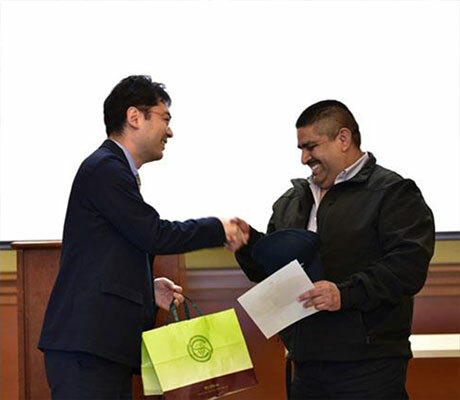 Naoki Kuze receiving a key to the company. 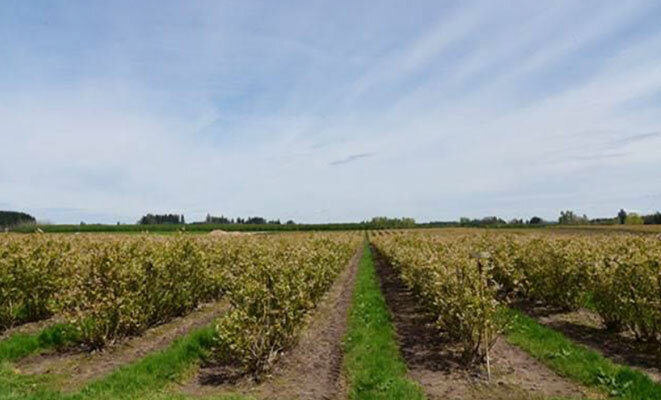 Blueberry farm owned by contracted farmer.